The former Hewlett-Packard chief executive Carly Fiorina has become the only female Republican candidate in the presidential election campaign, so competing with Democratic contender, ex-US Secretary of State Hillary Clinton. Carly Fiorina, who used to be one of the most powerful women in the US business world, rated number 10 by Forbes list of Power Women in 2004, announced on Monday that she is running for president, Reuters reported. “I think I'm the best person for the job because I understand how the economy actually works. I understand the world, who's in it, how the world works,” she said on ABC’s “Good Morning America” show. An April poll, presented by AP and GFK, revealed Fiorina’s low popularity, as just seven percent favored her – with 75 percent not knowing enough about her to say anything. Fiorina, 60, is the only female competitor to Democratic candidate Hillary Clinton, who has also expressed a hope of becoming America's first woman president. “I have a lot of admiration for Hillary Clinton, but she clearly is not trustworthy. She has not been transparent about a whole set of things that matter,” Fiorina, who positions herself as a conservative and pro-business candidate, said in the morning interview. She has never held public office, and in 2005 she was forced to resign from HP, when the company went through a $19-billion merger with the Compaq computer corporation. 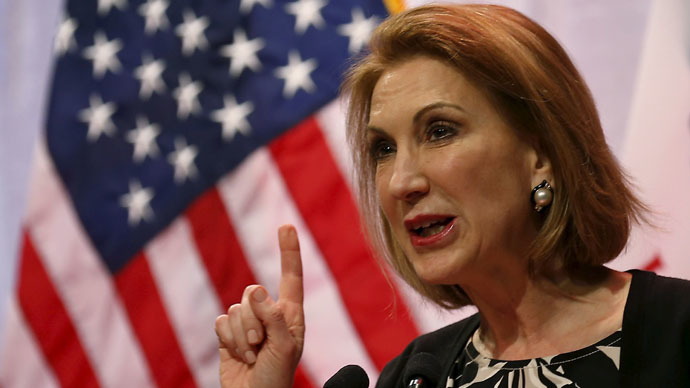 Fiorina was nicknamed the “anti-Steve Jobs” by InfoWorld. She was also ranked as one of the worst tech CEOs ever several times. The multimillionaire’s attempts to start a political career have been unsuccessful so far. She worked as an aide in John McCain's 2008 presidential campaign, and in 2010 she failed to become a US Senator, losing the election in California to Democratic Senator Barbara Boxer. Her first public event after the announcement will be on Tuesday in New York City, and at the end of the week she will campaign in Iowa, New Hampshire and South Carolina, according to AP. Born in Austin, Texas, she earned a Stanford undergraduate degree in medieval history and philosophy to become a law school dropout after a semester of studying. She has business degrees from the University of Maryland and the Massachusetts Institute of Technology (MIT). Fiorina started her career as a so-called Kelly girl at temporary staffing agency Kelly Services, and also worked as a secretary for Hewlett-Packard later to become its CEO. Currently, the breast cancer survivor is a leader of two charitable organizations: Opportunity International that helps impoverished entrepreneurs-to-be, and Good360, which promotes donations of excess merchandise to the poor.